Concept of Assimilation research papers discuss the desire to create and maintain a homogeneous “American” culture shared by all citizens. In the United States, the concept of assimilation is closely related the age-old desire to create and maintain a homogeneous “American” culture shared by all citizens. Unfortunately, this desire has often clashed with the desire to preserve the rich, multicultural heritages of America’s diverse population groups. In recent years, some conservatives have charged that the multicultural urge has undermined assimilation, causing many immigrants to remain burdensome outsiders rather than to integrate into the economic and cultural mainstream. Much recent research actually shows that recent immigrants closely match their predecessors in their commitment to pursue the American Dream and to adopt the core values of the society. Analyses U.S. Census Bureau data show that, although they may initially face major disadvantages, as their time spent in the United States increases, immigrants steadily assimilate in terms of such key measures as education, income, and homeownership. Still, there are areas where assimilation remains a troublesome concept. For example, much debate now surrounds the practice of segregating students of English as a second language from native speakers. Research shows that language learners in segregated classrooms tend to do better at least on standardized tests. Yet critics charge that language segregation retards assimilation and in communities with large immigrant populations the practice has created bitter linguistic and cultural divisions within the schools. As was repeatedly the case in the past, the concept of assimilation is once again a controversial one for America society. Transformation of the American Family Research Papers explore the differences in the modern American family and the affectional family. Multicultural Psychology research papers look into the systematic examination of human behavior, cognition, and affect in situations where individuals interact with others from different cultural backgrounds. Multicultural Content in Education - An education research paper on multicultural content discusses how teachers must learn how to integrate multicultural content related to cultures and minorities into classroom learning. Schlesinger and Multiculturalism research papers investigate how America has lost its sense of community. 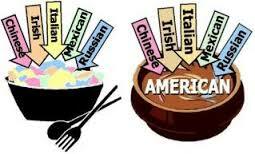 Cultural Divergence research papers explain the tendency for cultures to become dissimilar over time. Paper Masters writes custom research papers on Concept of Assimilation and discuss the desire to create and maintain a homogeneous “American” culture shared by all citizens.